I tried using wp-scripts but it's not usable at the moment for this kind of use-cases as it automatically uses wp. * globals. In this particular case I want to bundle the dependencies. Should we add --webpack-no-externals flag to wp-scripts build? We would have to add support for CSS as well. Does Parcel cover RTL support? Do we want an --webpack-no-externals. Is it something useful outside of this playground? It uses different externals and bundles CSS as well. Not certain why this is needed yet. Maybe a parcel thing. Wasn't it an issue only because Babel config couldn't be loaded? We're still using core/editor in some places in the block editor, it should be refactored properly to avoid the need to import this. I wonder if should have a simpler way to import all the required CSS styles for an npm package. I noticed that Gutenberg requires some global styles we're including in edit-post. There are probably some CSS tweaks we can make to make sure these are not necessary to have sane defaults. A lot of core blocks rely on the REST API... to work properly, if we can make them more generic, that would be a good win. I like how this playground (and the fact that we can use it as part of our dev workflow) would allow us to detect issues related to the npm packages more easily. 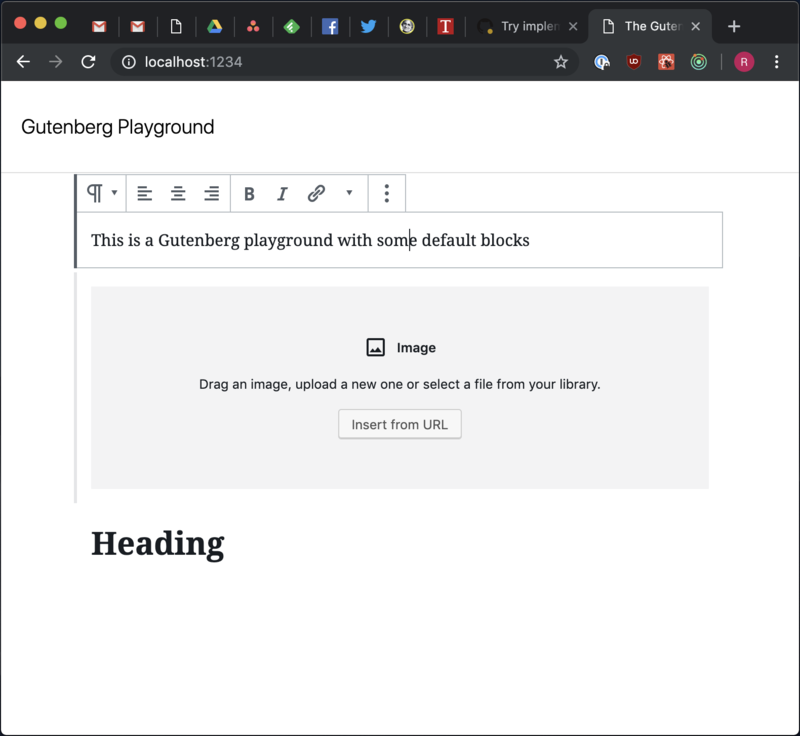 The content of this selector is a "reset" that is applied in Gutenberg but is not applied globally to WordPress as we don't want to mess with the sidebar/topbar. This could be extracted to a mixin as it's useful in edit-widgets as well. This is a WP-admin style assumed to exist in Gutenberg. This renders 0 if there's no fills. Here's the Gutenberg Playground at its current state. I'd argue that sometimes it's easier to work and develop in this separate context, for this reason, I think we should ship it and iterate on it. What do you all think? "test-unit-php-multisite": "docker-compose run -e WP_MULTISITE=1 --rm wordpress_phpunit phpunit"
Parcel tries to be smart and overrides our configuration. Can we move this config inside playground folder and maybe remove babel.config.js which is something wp-scripts build/start will use in the same form regardless? @gziolo Actually, there are a lot of these issues and I don't consider them a blocker personally. These are related to the fact that we require plugins for the registry... some API fetch networks should be done only if the WP context... I consider these as separate issues that if solved will improve the reusability of the block editor module and the block library. Should we add a new label Playground? Should this be highlighted in tomorrow's Core JS meeting? Having a hard time surmising from the conversation: Is Parcel intended to become a permanent tool? My main thought would be on the impact on install time (I think I measured it around ~8000 new dependencies) and maintaining multiple build toolchains, though I guess the proposed benefit in the latter case is that there's not so much configuration around Parcel to be maintaining. Parcel itself is an implementation detail as if I wanted to do the same with webpack, it would have required a lot of config. The dependency overhead is a real issue though, If I were to choose I'd actually think we should see if our current usage of webpack could be replaced by parcel :) but I don't mind the opposite. Having a hard time surmising from the conversation: Is Parcel intended to become a permanent tool? The downside is that Parcel comes with its own set of development dependencies and does some magic with Babel config which caused some issues as we had to override the default config we use.